How to have a flat 3d cube always face the camera. and I'd like to make a game in the style of wolvenstein (just for a bit of fun) where the players weapon is visible in front of the camera, but I've been kinda struggling to get this to work. I've been using this code, which works for z and x axis, but not Y. Sorry to post this again, I think Kjell might have answered this very same question a few years ago, but I can't find the code. r = tan(App.FOV/360*PI);  // If you're using a constant FOV, you can swap out this calculation with the resulting value. x = App.MousePosition.X*r*App.ViewportWidth/App.ViewportHeight; // If you're using a constant aspectRatio, you can swap out "App.ViewportWidth/App.ViewportHeight" with a specific value. I'd like to make a game in the style of wolvenstein (just for a bit of fun) where the players weapon is visible in front of the camera, but I've been kinda struggling to get this to work. You don't need any "fancy" calculations for that .. simply switch the camera from your 3D perspective camera to a 2D orthographic camera before you render your GUI elements. One of the examples i've posted on this topic can be found here. 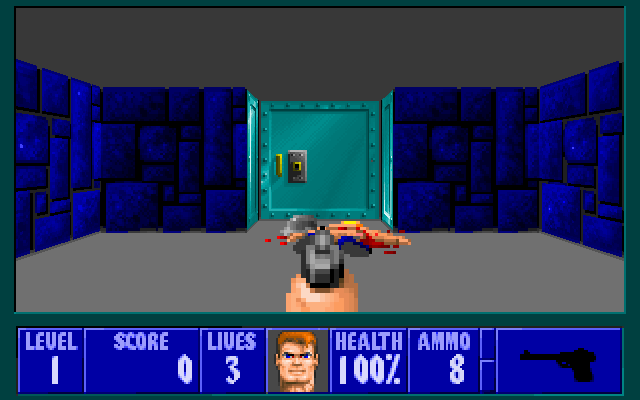 However, i've also slapped together a quick & dirty Wolfenstein 3D example. Basically it renders a frame as follows ..